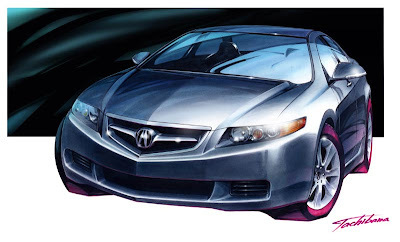 Drawing of a pre-2006 Acura TSX, notice no fog lights and the old style rims. In 2006, the Acura TSX got re-styled and some upgrades. The 2006+ Acura TSX comes standard with Bluetooth, fog lights, multi-informational display (MID), 205 hp SAE, and uglier stock rims. IMO, the newer 2006+ styling makes the TSX more feminine.